I would like to also address the phrase "at the last day." In John chapter 6, when discussing the bread of life that came down from heaven, Jesus states FOUR times that the the resurrection of the saints will be "at the last day." John 6:40 "And this is the will of him that sent me, that every one which seeth the Son, and believeth on him, may have everlasting life: and I will raise him up at the last day. " The Lord Jesus states this FOUR times! The resurrection of the saints is NOT seven years before the last day of this age, nor is it 3 1/2 years before the last day of this age, IT WILL BE AT THE LAST DAY! We must not try to avoid the plain teaching of Scripture by making this 'day' refer to a 'period of time' or to an 'epoch.' Very simply put, it is the final day of this age. It is the consummation day, the last day, the end. 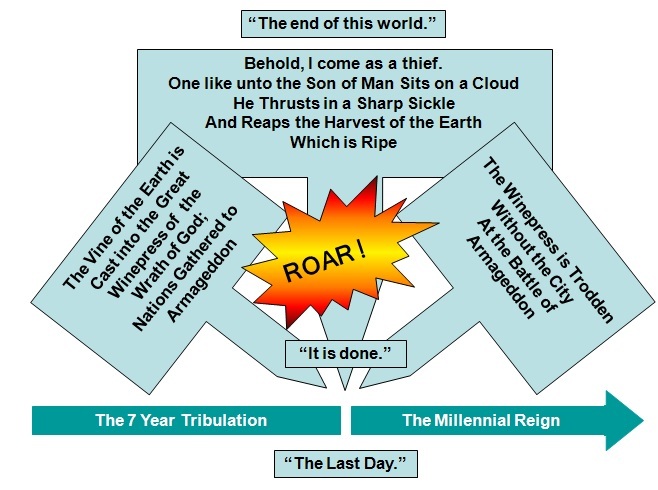 After this day, the reign of Christ on earth will begin. On this last day, we will see many of the great events of the future occur. It is the Great and Terrible Day of the Lord. And it is one, single Day.